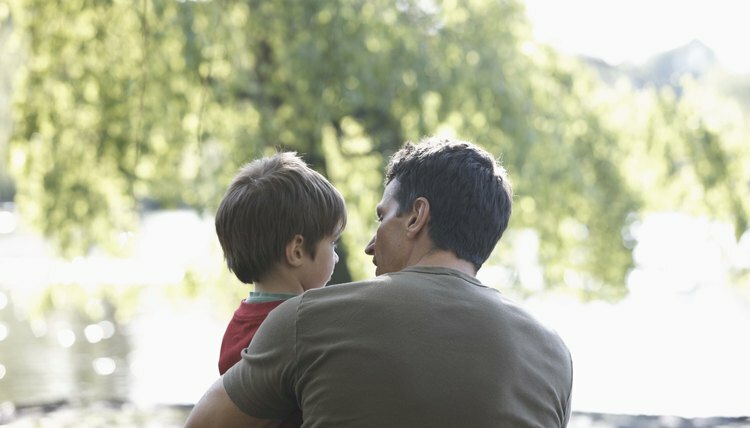 What Are a Father's Custodial Rights Before Custody Hearings? When a father is married to his child's biological mother, the court presumes he is the child's biological father. Therefore, both spouses possess the right to share legal and physical custody of their biological child prior to divorce proceedings and any custody hearings. Either parent can seek court ordered custody in the form of either a temporary or permanent custody order, depending on the stage of the divorce proceeding. A married father shares equal custody rights with the mother of his child. Most courts automatically recognize a husband to be the biological father of any child born to his wife. The hospital generally allows the father to be listed on the child's birth certificate without any additional evidence of paternity. Until a court decides otherwise, he shares the right to legal and physical custody of his child. Under legal custody, he shares in the legal, educational, health and welfare decisions regarding the child. Under physical custody, he shares in the responsibility to provide food, clothes and shelter for his child. Courts often require a signed affidavit of paternity, marriage certificate or birth certificate with the father's name listed on it as evidence in a custody hearing. During a temporary or permanent custody hearing, the father of a child should also be prepared to show the court the extent of his involvement in the child's life since the birth of the child. If the biological father fails to show consistent involvement in the child's life, the court may view any prolonged absence as abandonment. A court may also consider the child's past and current relationship with each parent when determining what type of custody is in the best interest of the child. A father may petition the court for a temporary custody hearing and request a court order for custody. Temporary custody orders establish both legal custody and physical custody of a child. Courts often order shared legal and physical custody to both parents. Alternatively, courts may award shared legal custody to both parents and primary custody, or physical custody, to one parent and secondary custody to the other parent. The parent with primary custody typically serves as the custodial parent and the parent with secondary custody serves as the non-custodial parent and has visitation rights. Temporary custody orders often influence permanent custody orders issued once the divorce is finalized. A temporary custody order established prior to the permanent custody hearing determines who will take custody of the child while the divorce is pending and establishes a parenting plan for the parents and child. Oftentimes, the temporary custody order impacts the permanent custody order. If a father is the custodial parent with equal parenting time and responsibilities under the temporary custody order, the court will often take this under consideration when creating the permanent custody arrangement. However, if a father neglects his shared custody rights and responsibilities under the temporary custody order, the court will likely look upon this unfavorably when deciding permanent custody. The court considers what is in the best interest of the child when establishing custody orders. Most states recognize a father's right to visitation with his child, unless the father previously abandoned or lost those rights. If a father knowingly fails to visit his child for several months or years of the child's life, the court may consider this abandonment. However, if a father never realized he had a child or the other parent prevented contact, the father's visitation rights remain intact. A father maintains the right to regular contact and scheduled visitation with his child, prior to any child custody hearing or court order being issued to the contrary. In extreme cases of physical or emotional abuse, a parent can lose visitation rights. Dishon and Block: What is Temporary Custody and Why is it Important? Gregory S. Foreman: How Is Child Custody Determined? Marriage is not a prerequisite to parenthood. The Centers for Disease Control and Prevention note that in 2009 alone, a surprising 41 percent of all births were to unwed mothers. For married couples, parental rights are assumed and automatic. While unmarried couples enjoy many of the same parental rights as married couples, the route to establishing those rights is often more complex.